The author-illustrator team of Betsy and Guilio Maestro presented to grades K through 5. They covered topics including research, writing, illustrating, editing, printing and publishing of nonfiction books. They stressed the importance of editing and explained how it can be used to improve your research and writing. Betsy was a kindergarten and first grade teacher for 11 years before becoming a fulltime writer. Guilio has illustrated more than 100 books. His paintings have been exhibited by various organizations. Together as a team, they encouraged our students to think on their own and helped them to understand the process of nonfiction research & writing. The Afghan Project encouraged and built student knowledge of Afghanistan’s culture and people from before September 11, 2001 through the present. This project provided all 6th grade students with an opportunity, through research and literature, to gain new knowledge, look beyond stereotypes, and form their own opinions about the Middle East and its people. As an assessment, students presented a “Living Museum” after using the IIM research process to create their products. Parents, administration, faculty, students and the community were invited to view the “Living Museum” aboutAfghanistan’s people and culture. Lastly, the project provided an opportunity to educate parents and students alike, in the use of the IIM process. The project was kicked-off in March with a workshop presented by the founders of the method, Cindy Nottage and Virginia Morse. This parent/student workshop was a first for Sutton and the benefits will reach far beyond one evening of training. In September, Michael Whittier of the High School Technology Department initiated the Floppy Free School Zone program in the Middle School and High School. 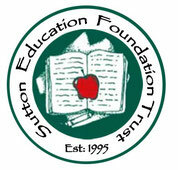 To assist in this initiative, the Sutton Education Foundation sponsored a grant that made 128MB USB Flash Drive Wristbands available to MS and HS students at a below-retail price. The opportunity to purchase these flash drives was extended to the Elementary students at the student discount price. The World Music Drumming Curriculum (WMDC) is an innovative cross-cultural, interdisciplinary curriculum that taught the fifth grade students how to play and learn about the African styles of music by actual hands-on experience in the classroom. This program addressed nine of the National Standards for Music Education. These instruments are being used throughout grades one through four in varying degrees. The fifth grade students gained respect for all of the instruments and their heritage as well as all ensemble members. The students learned a sense of appreciation; for one to improve they found it must occur as a class as a whole. As drummers, students learned the respect of leaving spaces (silence) for others to drum (speak). This follows into an important role in every person’s life; the art of learning when one should be a leader and then when it is essential to become a follower for the success of an entire group. It was a wonderful six-week addition to the music curriculum and confidence and creativity grew by leaps and bounds from all of the student. This project incorporated the skills learned in technology class throughout the year to produce a PowerPoint presentation to design a yearbook that contains pictures imported from various medias; digital, cd, email, scanning, and jump drives. The students will create a permanent record of their lives in 5th grade culminating in a video yearbook to be shown at graduation! The experience hopes to be a personal and technological milestone for each student! The “Science Discovery” grant provided all first grade students with the opportunity to connect science to the real world through hands-on centers and lessons focused on plant habitats. Small groups of students have utilized literature, poetry, songs, motion, technology, writing and various games to explore, demonstrate and discuss the life science of plants. As a culminating project, the students used their new, student created, habitat center to plant many of the plants they have grown and observed in the study.